Rev. Thomas P. O’Brien, CSV, died on Friday, June 8, 1990 at Silvercrest Nursing Home in Las Vegas, Nevada. Father O’Brien died at the age of 88 as a result of congestive heart failure. Thomas Patrick O’Brien was born in Killasser, County Mayo, Ireland on May 11, 1902 and was raised in Ireland until the age of eighteen. In February of 1921 he and his family emigrated to the United States and settled in Chicago. He attended both DePaul University and the Catholic University or America. In 1933 Tom joined the Viatorians and pronounced his first vows on September 8, 1934. He was ordained to the priesthood on February 10, 1938. 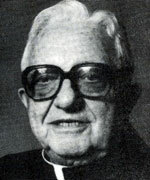 Much of Father O’Brien’s pastoral ministry as a priest and religious was spent in parochial and parish ministry. 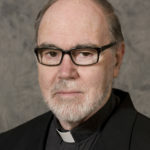 He served in many parishes including St. Viator Parish in Chicago, St. Joseph’s in Springfield and was Pastor of Sacred Heart Parish in Goodrich. He also served as Pastor of St. Patrick Church in Cavour, South Dakota. Other parochial assignments took him to parishes in Arizona and Las Vegas. After serving as an Associate Pastor at St. Joan of Arc Parish in Las Vegas from 1975-1977, Father O’Brien retired from active ministry. In recent years he lived at the Pinecrest residence in Las Vegas. He only moved to Silvercrest Nursing facility within the last few months. Visitations were held on Sunday afternoon, June 10, 1990 at Palm Mortuary in Las Vegas and on Monday afternoon and evening, June 11, 1990 at St. Viator Parish, Chicago from 4:00 to 9:00 p.m. A Mass of Christian Burial was held on Tuesday morning at St. Viator Parish at 10:00 a.m. Burial was in a family plot at All Saints Cemetery in Des Plaines. Father O’Brien is survived by two brothers, Andrew and Martin, and a sister, Mrs. Catherine Filan, all of the Chicago area. Remember Tom in your prayers and gather as a community to remember him at Eucharist.